The Trump administration appoints Roger Severino as director of HHS’s Office for Civil Rights, which enforces HIPAA. He was previously director of the DeVos Center for Religion and Civil Society of conservative think tank The Heritage Foundation. Severino is on record as opposing the ACA-mandated LGBT anti-discrimination laws that he will be charged with enforcing. He says those laws create conflicts of interest in providers who don’t want to provide gender reassignment surgeries. From Skip Church: “Re: the usual HIMSS publication. 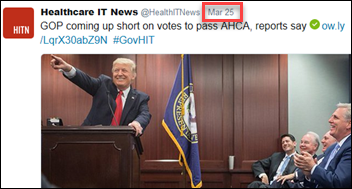 Their Twittarrhea is always annoying in recycling the same old non-news, but this weekend’s automatically scheduled tweets included a bunch of articles written before AHCA voting was cancelled.” I assume they didn’t realize that lame stories posted before the AHCA vote were going to look pretty stupid when hurled up afterward on Twitter regardless of the schedule vote’s outcome. Most puzzling, however, is why the site thought their readers needed their cheap-seats rehash in the first place. Actual news sites were already amply covering AHCA voting, deploying real reporters with inside sources to write their lead story that the site simply re-worded from “published reports” in a cheap grab for eyeballs. It’s also not really a health IT story. Meanwhile, this is a refreshingly honest “primary accountability” from the job description of a HIMSS associate editor. The tech industry has become such a colossus it has achieved a strange, self-interested triple role: as producer of flawed products and services, town crier about the gravity of these same vulnerabilities, and confidence man peddling the solution to the problem. Most poll respondents have access to the patient portal of their most recently visited provider and most of them used it, but more importantly, 75 percent of those who used it liked it. HITgeek says it’s silly that providers have “their” portal instead of each of us having our own that those providers populate, questioning why the health data of individuals can’t be as integrated as their bodies are. New poll to your right or here: Is your reaction to recent HHS appointments (Price, Verma, Fleming, Bardis, Severino) overall positive or negative? MedStar Health’s systems are brought down by a ransomware attack. Dell sells its IT services business to NTT Data for $3.05 billion to raise cash for its acquisition of storage vendor EMC. Epic updates its employment contracts with a mandatory arbitration clause to prevent lawsuits claiming unpaid overtime. Orion Health announces that it will lay off 36 US-based employees. Valence Health lays off 75 employees. 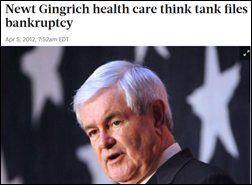 Newt Gingrich’s Center for Health Transformation closes and files Chapter 7 bankruptcy, listing several health IT vendors as creditors. VA CIO Roger Baker says the $4 billion joint VA-DoD iEHR system built by Harris Corp. could be available by 2014. Vocera shares gain 40 percent on their IPO day. BlackBerry maker Research in Motion reports sagging sales and an executive housecleaning. Several medical device manufacturers conduct large layoffs to offset the 2.3 percent tax levied by passage of the Affordable Care Act. The Coast Guard prepares for its go-live on Epic. Last week I asked readers for the most hilariously clueless one-sentence statement made by an executive in their organization. Consulting firm CEO: “It’s not my job to provide a vision. People just need to do their damn jobs.” (at a leadership retreat where the goal was setting a 3-5 year trajectory), The company closed less than six months later. "This is a go-live. No support tickets should be submitted with a priority less than high." Regarding a chronically unhappy (with good reason) customer who was a 15-minute drive from company HQ: "Its not worth the time for one low-volume family doctor." Turns out that low-volume family doctor was good friends with a board member of a large medical group the company was trying to sell to. CEO was upset that vendor had no way to upgrade the entire software with no downtime. Would have been content with a plan in near future for the vendor to do so. It only would have required re-writing the entire EMR from the ground up. Not to mention that certain upgrades require database engine and/or OS upgrades, which on their own also require downtimes. Even a failover to another instance requires a small downtime (OpenVMS folks, please stifle yourselves). “We need a button in there that does some science.” (executive feedback to an application developer). On "voluntarily leaving" after several years of poor performance and multiple rounds of layoffs: "I’m going to spend the next few weeks recharging my batteries and figuring out what’s next." This week’s question: What is the proudest moment of your health IT career? The White House and House Speaker Paul Ryan cancel voting on the American Health Care Act at the last minute after failing to gain the votes needed for its passage. A study concludes that mortality and morbidity is increasing among white, non-Hispanic, low-education American men due to drug overdoses, suicide, and alcohol-related liver disease, while life expectancy among those with higher educational levels is increasing. GE Healthcare announces plans to invest $500 million and hire 5,000 software developers over the next three years. President Trump appoints former Congressman John Fleming (R-LA) to the newly created position of HHS deputy assistant for health technology, after which Fleming expressed uncertainty about what the job entails because he thought he was interviewing for National Coordinator. Theranos offers investors additional shares if they agree not to sue the company or founder Elizabeth Holmes. Reuters reports that Advisory Board Company and Evolent Health are considering a merger of some or all of their businesses but ABCO has other bidders, among them Press Ganey. Advisory Board and UPMC created Evolent in 2011 and it went public in 2015, with Advisory Board owning 13.7 percent of the shares. 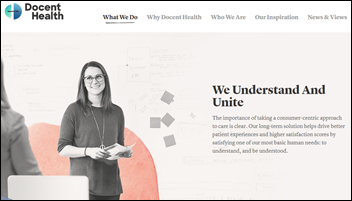 Docent Health expands its in-person patient experience program with digital and phone-based services. Vince and Elise kick off their annual series covering the top 10 HIS vendors. Children’s Hospital of the King’s Daughters (VA) reports a fourfold investment return in 24 months from working with Influence Health to book procedures to correct a rare pediatric chest wall deformity. 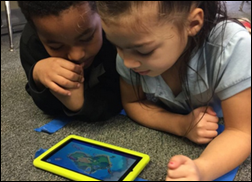 ZeOmega will exhibit at the Population Health Colloquium March 27-29 in Philadelphia. I am a huge fan of Vince’s industry information, so don’t take this the wrong way. Regarding the ranking by revenue, however, I don’t understand how ECW with “13 pilot sites in the works” gets on a list where “accute care is their primary market.” Also hard to believe Athena makes the list as acute care is definitely not their primary market. GE Healthcare has about 20 hospital site that do their hospital billing, and with its PACS business, has HIT revenues of over $600 million so I’m not sure how they get left off. There is no way this amount would pay for 5000 software devs for 3 years in North America. It looks like GE is thinking of an offshore team (India or elsewere?). I wonder how Trump is going to react to this. I seem to recall that Jeff Immelt, GE CEO resigned from one of Trumps special business committees about a month ago, maybe that’s why?? 2. Trump gave it a lukewarm hug. 3. The rest of the country registered their discontent. 4. GOP pulled the bill (good decision). I only hope the Pres has moved past his toddler tantrum about letting ObamaCare die on its own so we can start working on getting rid of the flaws. GE Healthcare – Having worked at an IDX client in my distant past, this is very interesting. They sound committed, but wondering how much is throwing all their resources at a dying patient. PS – Absolutely love the DonorChoose stuff — still an outstanding way to use your online presence to improve the world.